Considering organizing or unionizing your workplace? We can help you prepare yourself for the conversations you will likely have with your employer and co-workers. Section 149 of the Labour Relations Code makes it illegal for an employer to bully an employee “by intimidation, dismissal, threat of dismissal or any other kind of threat,” into not joining a union. Even without a union, everyone is protected under this law. If your employer breaks this law, Teamsters Union 987 can help you fight back. Similarly, the Code states that employers may not give preferential treatment to anyone who expresses negative opinions about unionizing. Ultimately, your employer is not allowed to even ask you to share your views about organizing. "What Exactly Is A Union? Are Paying Union Dues Worth It"
A union is any number of employees who have decided they would rather negotiate their terms of work as a collective group than on their own. 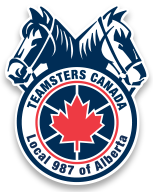 Teamsters Union 987 union dues are equal to approximately 2.5 hours of pay per month, and they’re tax-deductible. If you consider this small amount like insurance that protects your job security, among all of the different 987 member benefits , the nominal costs are far outweighed. "The Company Follows Legal Workplace Standards. Though the labour movement has made many advances over the course of the last 100 years, the current laws in place to protect workers are not yet strong enough. Without a union, employers have the freedom to pay a low minimum wage, ignore seniority, favour workers, fire employees at their own discretion and ignore workplace grievances. Does that sound like protection? In a union environment, everyone works together as a collective, and as such they are all recognized for the value and revenue they generate for their company. "I Know That One Time Was Bad. But It Won't Happen Again." When something goes wrong in the workplace and employers are not held accountable for their actions, there is little in their way to re-offend. With a union in place, employees can rest assured they have a powerful family behind them should they need to take action.